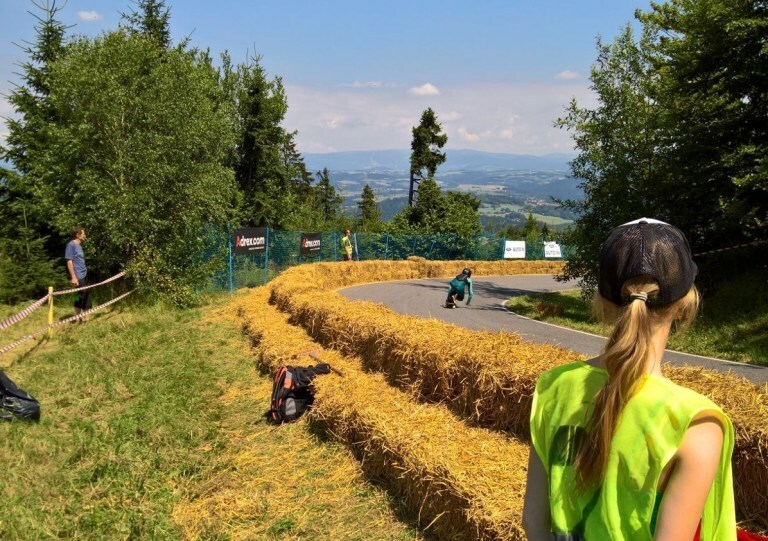 I have to admit I decided quite spontaneously to participate in the international downhill skateboarding race „Kozakov Challenge“ in the Czech Republic. And it was also a reckless decision, since I have been longboarding for only one year. But it was more than worth it to go there. What a crazy feeling: Bombing down the track for the first time in my customized leather suit. „You know that you need a leather if you want to participate in an IDF (International Downhill Federation) Race?“, one of my friends asked me. Of course I knew, and the time was tight. 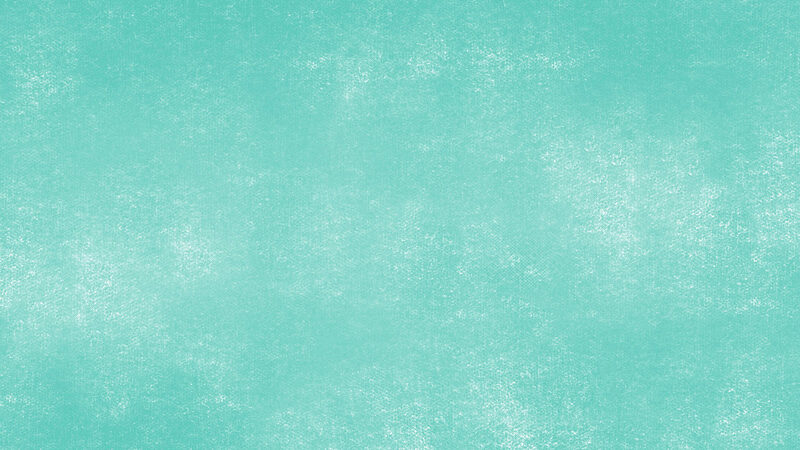 But he helped me with my order and three weeks later I squeezed myself into my customized turquoise leather suit. 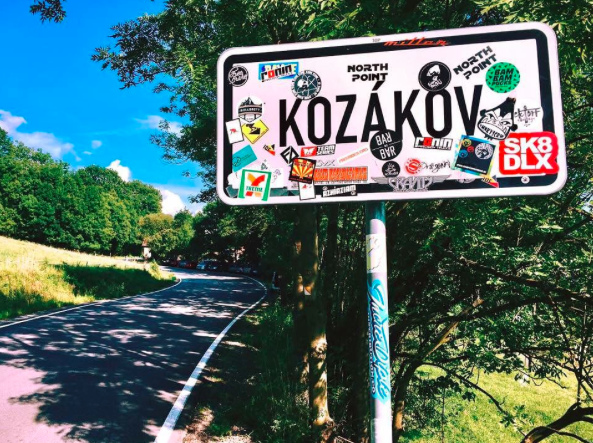 Next challenge: How to get to Kozakov, to this hill in the middle of nowhere in the Czech Republic? No problem, some people always share the ride to skate events. On facebook, I found someone who could give me a lift. I was lucky, because I could join Patrick Switzer and Tamara Prader. Both are professional longboarders and old hands in skate scene. 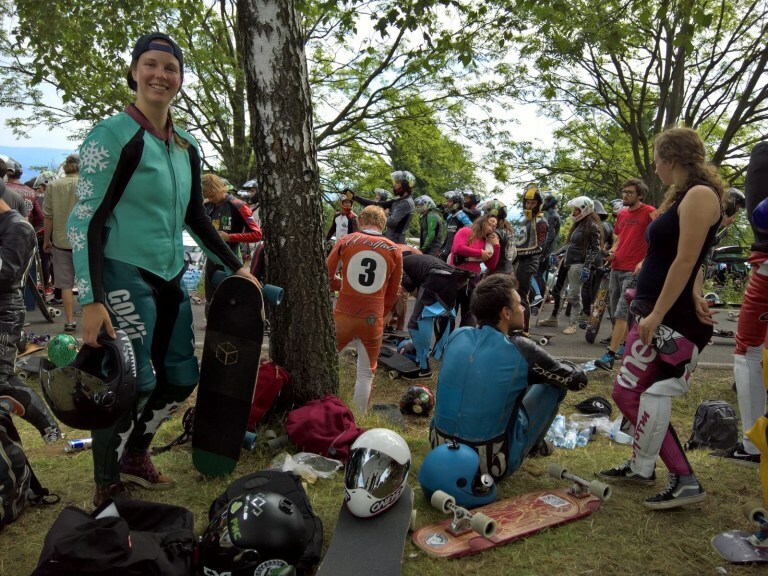 During our ride and the event, they shared loads of amusing stories about their skate life and handy tips for the race. 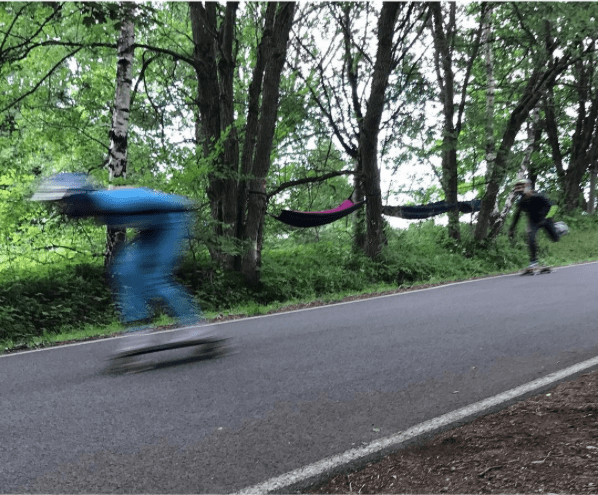 In this usually sedate village, once a year the best downhill longboarders compete against each other. Three kilometer length, three hairpins, some sweepers and a max speed of 90 km/h – this was in store for me at Kozakov Challenge. 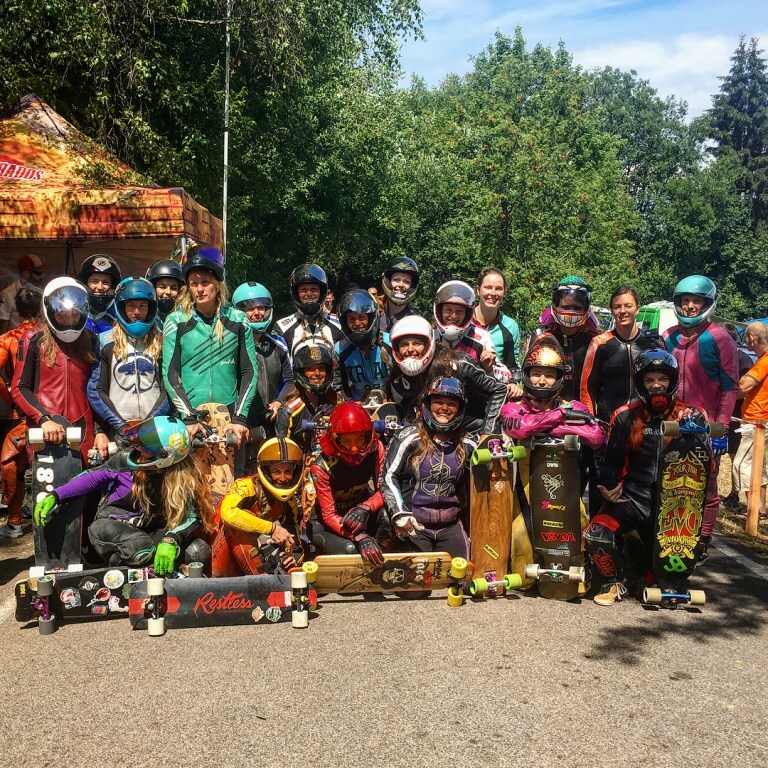 I started longboarding only one year ago, so this event was a bit (maybe a quite bit) above my level. Therefore, some of my friends advised me against that event. Okay, it was obvious that I didn’t stand a chance to win. There were 25 ambitious and trained women (usually, there are around 10 girls per event). However, I didn’t go there to win. My goals: Staying in one piece, improving my skills and having loads of fun. And I succeeded in everything. I didn’t eat concrete or hay many times. And my leather saved me from road rashes. The ambulance had to move out for some broken limbs and dislocated shoulders. „Just trifles, that’s part of a race“, Tamara commented with a grin. The organizer CGSA was doing everything possible in order to make the track and race as safe as possible. Every corner was padded with hay bales. And marshals along the track would close down if there was an accident. Marshals like here in „Corner 1“are responsible for the safety on the track. At the end of the track, there were three busses from our grandparent’s time waiting. Around 180 sweaty skaters in leathers and 30 degrees outside transformed the busses into smelly saunas. In walking speed, they brought us back to the start line on the top of the hill. There was also the party tent and the camp ground for skaters. I had my tent there and if the weather allowed it, I slept in my hammock next to the start line. I heard the riders fly past when I was taking a powernap. Between the heats, we had a lot of time to kill. People were talk shopping about lines, wheels and race strategies. I tried to understand all those technical terms. Especially wheels seemed to be important. The skate pros changed their sets after every run (my best time was 2:56, the winner had 2:19) because they lost the shiny layer and therefore the grip. With my speed, this aspect was insignificant. Waiting on the start line: Suddenly I was part of a scene I only knew from pictures so far. Actually, I should call it „the parties“, because people were partying in the big tent from Monday to Saturday. For around 1.5 euro, the beer was dangerously affordable. Since it was still a sport event with high physical exertion I wasn’t partying every night. Some seemed to be used to this lifestyle and already after a few runs, they grabbed a beer, sat in the corners and watched the others racing and crashing. Smoking weed was as common as drinking beer and a few people also took some other hallucinogens. That’s not for me, I had enough adrenaline rushing through my veines and “stoke” in my face. With old and new friends, enjoyed the almost cheesy sunset daily. My first skate trip couldn’t have been any better. It’s certain: I’m coming back next year. And I’m gonna train hard in order to have a chance against all the fast ladies and gentlemen there.  But first, my road trip goes on: In Slovenia, on the border to Croatia, there is another skate event for one week: The KNK. I’m excited to skate the 18 Hairpins. And here you get an impression, what the Kozakov Challenge 2016 was like.